WASHINGTON (March 4, 2019) – Chevy Chase Trust, nationally ranked by Forbes as a Top Wealth Manager, has selected MDB Communications as Agency of Record to develop and launch a new marketing communications program. Headquartered in the Washington, D.C. area, Chevy Chase Trust is a multi-generational independent investment advisory firm, with more than $29 billion of assets under management, and over 90 professionals with an average of 20 years of experience. Known for Thematic Investing, they invest in global themes and build equity portfolios of companies positioned to exploit powerful, secular trends, disruptive ideas, innovations and economic forces. MDB Communications, a full-service advertising agency based in Washington, D.C., was selected after a competitive review involving multiple agencies. The firm will provide research, strategy, creative and media-buying services. The new campaign, launching in Q2 2019, will use a variety of media channels and marketing initiatives that promote Chevy Chase Trust and its unique philosophy on thematic investing. “Chevy Chase Trust is on an upward trajectory. We look forward to working with MDB to further cement our unique brand positioning, and engage investors now and in the future” said Chevy Chase Trust’s, CMO, Stacy Murchison. Founded in 1981, MDB Communications Inc. is a full-service advertising and marketing communications firm focused primarily on consumer branding, social media and developing advanced SEM programs and contextual targeting initiatives for companies, associations and nonprofits. The firm has won more than 187 awards for client work and is headquartered in Washington, D.C., with affiliate firms in Asia/Pacific and Europe. Chevy Chase Trust is a privately owned investment management firm and think tank specializing in global thematic research, and conflict-free advice and planning for high net worth individuals, families, endowments and institutions. Headquartered just outside of Washington D.C., the firm has more than 90 professionals averaging 20 years of experience, and a client retention rate of more than 98%. The firm is a thought leader and performance leader in global thematic investing. New York, NY – Dec. 28, 2018 – The National Advertising Review Board (NARB) recently welcomed 6 new members, selected for their standing and expertise, to serve with the advertising industry’s only peer-review organization. The 70-member NARB, founded in 1971, is the appellate unit of the industry’s self-regulatory system. NARB decisions provide informative guidance to advertisers and help assure that advertising claims are truthful and accurate. To assure a diversity of perspectives, NARB panelists come from companies that advertise, from agencies that create advertising and from schools and universities that offer advertising and marketing course work. Panelists are nominated to serve by the 4A’s, the American Advertising Federation (AAF) and the Association of National Advertisers (ANA). All panelists are volunteers. “Because advertising is designed to be influential in shaping perceptions and beliefs there is also tremendous responsibility to ensure its validity and accuracy. I am honored to help the NARB fairly assess disputed cases to maintain the integrity of the industry,” said Holly Aguirre, President, New Honor Society. Five-member NARB panels are convened to review disputed decisions of the National Advertising Division (NAD) or Children’s Advertising Review Unit (CARU). NARB panelists examine the record of NAD or CARU proceedings and make determinations as to the truth and accuracy of the advertising claims at issue. In the past three years, NARB panels have evaluated claims for products as varied as motor oil, pet products, personal care products, internet service speeds and quality, household products and dietary supplements. Agency receives three awards for its illustration series and integrated ad campaign. 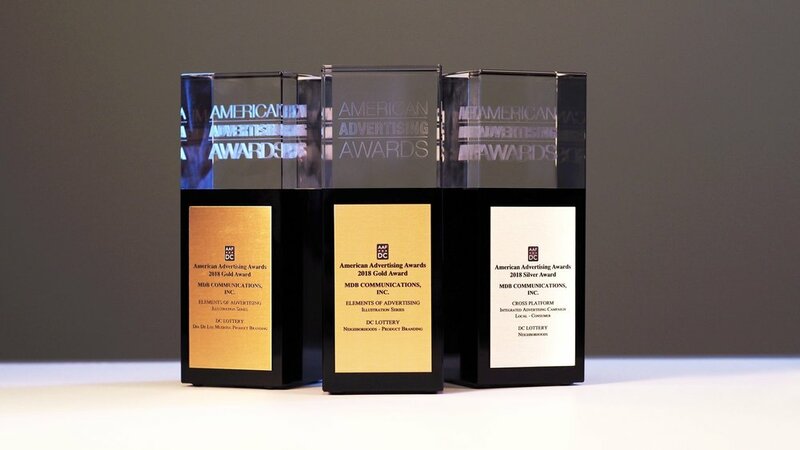 Last week, MDB Communications was honored as the recipient of three ADDY Awards at this year’s Washington DC American Advertising Awards Gala for its work done on behalf of the DC Lottery, out of a pool of nearly 600 submissions. The ADDY Awards are the highest recognition in advertising, and last night’s win increases MDB’s total ADDY win count to over 35. MDB was specifically recognized in the categories of Product Branding and Integrated Advertising Campaign for its wildly successful “Neighborhoods” series, which has closely tied the DC Lottery to the uniqueness of various DC neighborhoods, including U Street, Georgetown, and Capitol Hill, to name a few. Other work that won included an innovative Día de los Muertos scratcher artwork that was honored in the category of Product Branding. The annual awards ceremony took place Thursday, March 29, 2018, at Gypsy Sally’s in Washington DC’s Georgetown and was attended by leaders across the advertising industry. MDB Communications, Inc., is a full-service, integrated and strategic marketing communications agency powered by experienced leaders, innovators and problem solvers. Founded in 1981, MDB is focused primarily on consumer branding, social media and developing advanced SEM programs and contextual targeting initiatives for companies, associations and non-profits. The firm has won more than 234 awards for client work and is headquartered in Washington, DC, with affiliate firms in Asia/Pacific and Europe. Washington DC, (March 22, 2018) - Last week, MDB Communications Inc. released a unique new TV spot to promote the launch of DC Lottery’s new DC2 game. The spot features a silhouetted figure dancing along to an original song created by MDB and local production company IMG (Interface Media Group). The music motivates the dancing, the dancing motivates the animation, which accentuates the story told in the ad. Inspired by the music videos of many of today’s most popular musicians, the spot is further evidence of MDB’s commitment to versatility and novel approaches in support of clients’ needs. “We’re excited to introduce this new game, which is unique to the region, with a one-of-a-kind sound and campaign that aims to differentiate the DC Lottery in an extremely competitive gaming market,” added Beth Bresnahan, DC Lottery’s Executive Director. In creating the ad, MDB was proud to continue its tradition of supporting local Washington DC businesses, employing a DC-based production company and local talent in order to make a uniquely DC advertisement for a uniquely DC product. WASHINGTON, DC (December 15, 2017) — MDB Communications continues to attract some of the biggest talent in DC and Creative Director, Bill Hartman is now one of them. Bill is joining MDB from Discovery Communications where he served as a Creative Director and led consumer brand assignments for Shark Week, Cake Boss, Animal Planet and Deadliest Catch among others. “Bill brings two decades of creative brand leadership to our team. I admire his extensive multidisciplinary, national experience. We’re all delighted to have Bill rejoin the management team and MDB family,” said Cary Hatch, CEO of MDB Communications. This is Bill’s second tour of duty at MDB; nearly a decade ago, he was an Art Director with the agency. Washington – (August 2, 2017) - MDB Communications today announced the promotion of Maria George to Senior Account Executive and Andre Rolle to Designer/Art Director. Since joining the agency in 2014, Maria has played an integral role in servicing and managing several key accounts including Fannie Mae, DC Lottery, Destination DC, Pepco and others. Dre has been a key member of the Creative Department since he joined MDB in 2014. He’s worked on various client brands, including the DC Lottery, Destination DC, Heroes, Inc., Free Speech Week and others. Before joining MDB, Dre was a graphic designer for Dash Marketing & Co. and provided art direction for brands such as Comstock Home, NEVO Realty and NAR & Co.
MDB Communications, celebrating more than 25 years of being independently owned and wholly committed, is a full-service integrated advertising and marketing communications firm. In addition to clients such as Fannie Mae, the DC Lottery, Destination DC, and the Newseum, it works on a pro-bono basis for Samaritan Inns for the homeless and the Partnership for a Drug-Free America. Visit MDB online at www.mdbcomm.com. Washington – (August 2, 2017) - MDB Communications today announced the promotion of Gretchen Carswell to Creative Director. Her promotion follows MDB’s continued year-over-year growth since 2015. Carswell has played an integral role in contributing innovative creative executions for several key MDB accounts including Destination DC, the Newseum and the DC Lottery. Her duties include leading creative efforts on a number of television campaigns, radio, brand identity, online programs, out-of-home and social media initiatives. Prior to joining MDB Communications, Carswell was an Art Director at Goldberg Marchesano Partners working on National Geographic, Iceland Air, ConEd and Catholic Charities; and at Rainmaker Creative Thinking during the dot com boom. In addition, Carswell spent time at ENC Strategy servicing government contracts for clients such as Department of Defense, Department of Energy and the SBA. Gretchen is a graduate of the VCU AdCenter (now Brandcenter). She's earned recognition from The One Show, Richmond Show and the American Advertising Federation. Her work has been published in The One Book, Communications Arts and CMYK magazines and exhibited at The One Club in New York as part of a spotlight on young creatives. She was an adjunct professor at VCU teaching design, illustration and advertising. She also helps lead creative thinking workshops for agencies, business leaders and students. HEROES, Inc.® has rolled out a regional PSA campaign to coincide with the 15th Anniversary of 9/11, in hopes it will encourage our community to remember and honor the families of first responders who fall in the line of duty. Created by MDB Communications, the out-of-home public service campaign puts a spotlight on the little-known 52 year-old nonprofit.